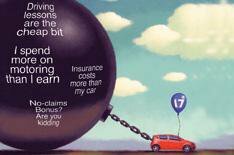 10 ways to cut insurance | What Car? Boosting the amount you pay in the case of an accident can have a direct effect on your premium. A 400 excess increase can bring your premium down by almost the same amount. Going for the top-of-the-range trim level might well bump you up an insurance group. If a 17-year-old driver upgraded from a Studio to an Edge trim on his Fiesta, his costs could jump by around 400. Third party or third party, fire and theft cover is usually cheaper than comprehensive insurance, but the average saving is so small that we would always recommend choosing the best cover you can afford. Convincing a parent to join you on a policy can bring down costs significantly. Our sample driver reduced his premium by more than 1100 just by adding his 51-year-old accountant mother to his insurance. Insurers appear to be undecided on the merits of the most popular further training: Pass Plus. Some dont offer any discount for taking the six-hour course, while the average for those who do is 456. Check with your insurer before you commit. If you can convince a parent to let you use their car, many insurance companies will now let you build up a no-claims discount on someone elses vehicle. Some insurers might not charge you for adding alloy wheels, but that full bodykit could end up costing you more than its pricetag suggests. Having your driving hours restricted to, say, 6am-11pm may not be for everyone, but it could save you a packet. A step up from our basic 1.25-litre Fiesta to a still-modest 1.4 bumped up insurance prices by more than 250. Start your search on comparison websites, and then ask companies directly if they can be the lowest that you find. Savings based on a 17-year-old male student living in suburban south Wiltshire. He has held his licence for six months and wants to insure a new Ford Fiesta 1.25 60bhp Studio 5dr.